Ned-Chest® is a hands-on Nursing Education Device which allows you to both demonstrate and instruct. It also allows you to practice procedures using Indwelling Central Venous Catheters (CVCs) and Implantable Venous Access Devices (IVADs). 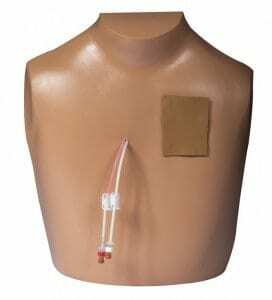 Ned-Chest® was developed in cooperation with Mayo Clinic and is designed to make training both easy and realistic. Whether you’re working with students, family members, nursing professionals or patients, Ned-Chest® will familiarize them with the use and management of vascular access devices. Coated surface that resists tape residue, betadyne stains and the effects of alcohol and other cleaners. Comes with a durable fabric bag for easy transport and convenient storage. Training aid for instruction in site care, heparin irrigation, I.V. bag hook-ups, principles of asepsis and techniques to prevent the development of an air embolus. Ned-Chest® comes with a functional, simulated long-term central venous catheter with dual lumens and luer lock injection sites connected to two replaceable I.V. bags. One bag is filled with red saline solution while the other contains a clear liquid. Both have been treated with an antifungal product. Ned-Chest® features a receptacle for an implantable venous access device (IVAD) which is covered by a removable flap of latex “skin”. The foam insert may be cut to secure any model IVAD. The receptacle features I.V. tubing ready for attachment to the IVAD of your choice. To order your Ned-Chest®, please click on the Shop tab, or call 651.385.2175 x3087. If you are using a purchase order email sales@acrotechis.com.